It was with great anticipation that I awaited Lynn Austin’s newest labor of love, her book “All Things New”, especially given the theme of the book – the Reconstruction Era. I have read all of Ms. Austin’s previous works on the subject of American slavery in the 1800’s, along with other fiction and non-fiction books on the same theme, but had never read any works focused exclusively on the Reconstruction Era. In short, this area followed the Emancipation Declaration of 1863, which declared it against the law to own slaves in the U.S.
From the first few pages, the author transports us to the White Oak plantation in the deep south, owned by the Weatherly family in 1865. The civil war had just ended after devastating life and land in the south, and both whites and their former slaves were left to pick up the pieces and try to adjust to a new reality. Families could no longer own slaves or force them to work, yet they depended on the help as their large plantations could not thrive and survive without the labor they had been accustomed to. Black slaves were free, but having been born into slavery and living in fear of their former masters, many of whom still held on to old traditions and beliefs, the blacks were not yet free in spirit. Furthermore, without the resources to own land or rebuild their lives, the former slaves had nowhere to turn but to the people who held them captive by force and fear for generations. 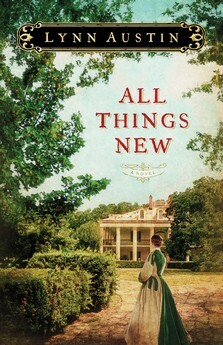 All Things New follows the individual lives of several families following the war. The main character, twenty-two year old Josephine, has lost her father and brother to the war, and is learning to adapt to the loss and dramatic changes in her life alongside her mother, sister and brother. Her mother, Eugenia, tries to deal with the changes by trying to bring back the grandeur of the past, controlling her daughters and the freedmen that stayed behind on the plantation, and clawing through her grief at anything that she believes will bring her happiness and social status back. Meanwhile, her brother returns from the war dealing with his bitterness by plotting revenge on the Yankees and the former slaves. Their attitudes and actions seems appalling to Josephine, who has befriended their former slaves and sees things through a new heart. Set in an era when women and girls are raised to submit without question to authority and elders and to defer all decisions to their parents or spouses, imagine the turmoil when young Josephine begins to question her family’s position on slavery and begins to follow God’s heart for the least of these? What does one do when she questions God in the midst of all that’s been taken from her, through the drastic changes in her life, and yet finds herself following a calling that’s against the grain, creating more challenges and changes than she’s ever known? This book not only has an invaluable and thought-provoking view on the realities of slavery and the transition as slaves gain freedom and their masters change their ways, but it also has some of the best answers to timeless questions such as why God sometimes seems not to answer questions, and why the characters who resisted change experienced such trials and challenges. I appreciated how many unique characters were brought in to the story to give us a complete picture of the way our past, differences and personalities affect how we deal with change, as well as how God uses each one of us to redeem what's been lost. There is profound wisdom and solid truth in this book, and it's beautifully embedded into a story you won't soon forget. Although the author mostly focuses on the lives of three strong women -- a mother, a daughter, and a slave -- the author beautifully weaves in the stories of the men that surround these women, and the effect these men have on the lives around them. Every work of Lynn Austin’s is impeccable in the way it transports us and causes us to really consider the lessons that can be learned from past generations and from the trials of life. This book, though, takes it to a whole new level. Whether or not you have an interest in history, slavery or even Christianity, this book is meant to be widely read and distributed. The stories are as relevant today as they ever were – in terms of slavery, yes, but in terms of bitterness, hardened hearts, following God’s calling, questioning God, seeking revenge, wisdom through change, and loving one another as He loves us. I couldn’t put it down. I even found myself taking notes of some of the answers God provided through certain characters of the story, mainly the wise Mr. Chandler! This book, although new, is already a timeless classic in my heart. If Heaven has a library, this is surely in it. God has grown and challenged me through the mission field in the past 12 months. Ghana in November of 2011, where God provided the resources to shelter up to 100 rescued child slaves and blessed the negotiations to release 2 children from slavery. Cameroon in February of 2012, helping with school and water development projects for children and communities living in extreme poverty. Priceless experiences and growth, but carrying the Cross has a precious cost. While the faraway mission field had made a significant, life-(and-faith)-altering impact on me, my home mission field was about to suffer a serious blow. I came home from Cameroon to discover that my spouse had not only lost his job, but worse, had chosen to leave our family/marriage. With our family irrevocably restructured and the income halved, to say it has been a year of loss would be an understatement. That is why I had not anticipated God being willing to use me in my shaken, stumbling state, to go to the faraway mission field once again and serve Him by faith. In time, yes, but now? What could I offer in this season of loss? How could I be the hands and feet to the broken when I, too, felt just as lost and broken? “I’m not asking whether you can do this. I already know you can’t. My answer was an apprehensive, subdued, yet faithful “Yes”. Over and over again, God uses the weak – like me. My life has changed, yes, but God Himself has not changed – and that’s why He calls me once again. I will trust and serve Him. 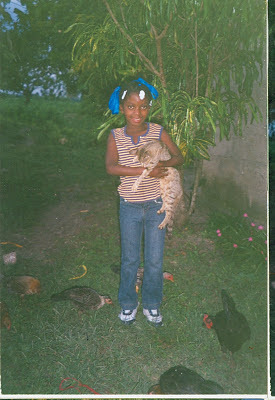 In November of 2012, I will be traveling with my 11 year old daughter Jillian as well as my best friend and Ghana team member, Tia, to the Les Cayes region on the South West shores of Haiti. Our primary project will be to provide a home reconstruction for one family so that their home will become a dry, secure safe haven. The Castel family lives on the outskirts of Les Cayes with extended family in a house that is crumbling around them. They have 3 young children, one of whom has disabilities. 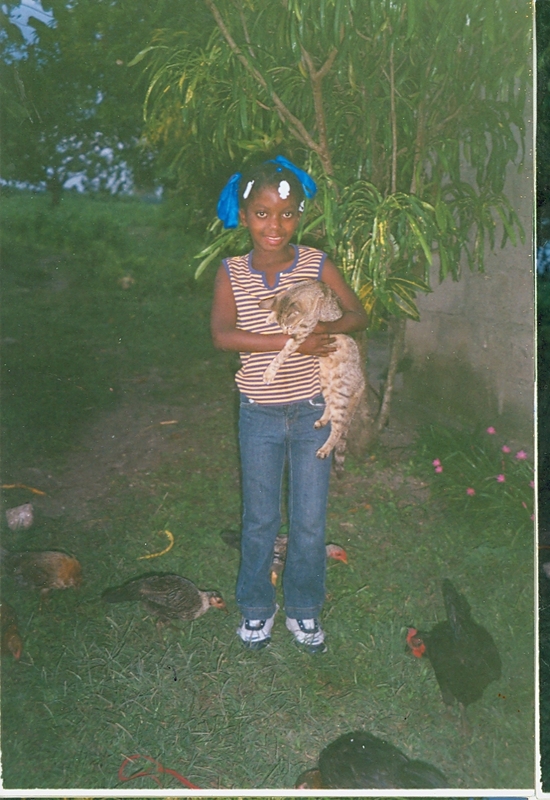 Medgina suffered brain trauma at the age of 3. Now 11 years old, she has repeated Grade 2 several times, and is yet unable to reach past this grade level academically due to the learning disabilities and memory loss caused by the brain trauma. Jillian is Medgina’s sponsor, and also suffers from learning disabilities as well as autism, and like Medgina, struggles in school and in life. Unlike Medgina, Jillian has a warm bed and a safe home to sleep in. We seek to bridge the gap and provide relief for this family, and at the same time, grow Jillian’s heart for the mission field. Beyond the home restoration, we will be serving the needs of the community that surrounds Medgina’s family, distributing school supplies as well as seeking to tend to the needs of the “restavek” child slaves and orphans in the area, much as we did in Ghana. We will simply be God’s vessels, led by Him, seemingly empty, but pouring out from His abundance, into the lives of the people of Les Cayes and Torbek in Haiti. All funds over and above this will be poured into the needs of the Les Cayes and Torbek communities. We are currently at 30% of the funds raised!! In Canada, tax-deductible donations can be made by cheque, cash or Paypal. For payment address and instructions, please contact JD@beyondmeasure.me. Donations can be accepted this way from anywhere, but receipts for PayPal transactions on the sidebar link will only be provided to U.S. residents. We have taking this trip on our own, not through any group or organization. This trip is ALL about faith. We are already growing through this, challenged and stretched by what’s ahead, and learning to completely rely on God. While there, we trust God to keep us safe, provide our resources, guide every single step, lead us to every need He will fill through us, and to teach us through the people of Haiti. This isn’t “our” trip nor “our” plan, but His – and yet through this, He will not only serve the needs of His people in Haiti, but He will invest into our growth and our lives. Will you invest in us too? Please be in prayer for this trip and for God’s provisions to be sufficient, even overflowing. We urge you to pray for our safety! We are aware of the potential dangers and are asking God to surround us and supply security as we serve. Haiti is a place of unrest, disease, spiritual warfare, and extreme poverty. It will be unlike our experiences in Africa. Much more importantly, Haiti is a place of hope and healing… for them… for us. We ask that you continue in prayer throughout the days ahead, and while we are in country. Your prayers and support are vital to this mission. If you have any questions or concerns, please don’t hesitate to let me know.